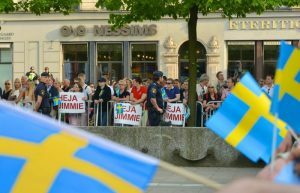 Does Sweden's Radical Right Reflect Too Much Social Inclusivity, Or Too Little? Many have attributed the success of the far-right Sweden Democrats to Swedenâs open immigration policy. Instead, a new study shows that income inequality and labor-market conditions may have fueled the rise of the Swedish radical right. On September 9, 2018, 87 percent of eligible voters in Sweden participated in a general election that attracted attention around the world. Scandinavian politics may not be everyoneâs idea of excitement, but this election was different. The Sweden Democrats, a radical-right party often tied to xenophobia and past Nazi sympathies, were polling stronglyâ"at some poi nt even reaching first place among menâ"and threatening to access real power. Perhaps, the rise of the Sweden Democrats resonates widely because it echoes populist right-wing gains in several other countries, like Austria, Finland, Hungary, Turkey, and the United States. Indeed, the ideology of the Sweden Democrats is typical of the radical-right (Rydgren 2007, 2018). It offers an agenda of anti-immigration policies, establishment critique, and socio-cultural conservatism. Over time, the ideology has been moderated from biological racism towards cultural national chauvinism. Some of these values are inimical to liberal democracy and made the 2018 election seem pivotal for future Swedish politics. How did Sweden, an icon of left-leaning, welfare-intensive Social Democracy, get to the point where the radical-right could redraw its political traditions? Our recent paper âEconomics Losers and Political Winners: Swedenâs Radical Rightâ attempts to answer t hat question. The Sweden Democrats were formed in 1988 and remained a small party until their entry into parliament in 2010, followed by broader success in 2014. In the latter election, the Sweden Democrats became Swedenâs third largest party with 12.9 percent of the vote. In the September 2018 election the party failed to come first or second, but remained the third largest with 17.5 percent, which afforded more parliamentary seats and a shot at shaping government formation. The growth of radical-right parties is often attributed to immigrant and refugee inflows. This is a simple, and therefore tempting, explanation, especially in Sweden where immigrant inflows have been substantial. But this is perhaps an instance where Occamâs razor is best left unused, as reality appears slightly more complicated. The growth of the Sweden Democrats predates the 2015 refugee crisis. Our research shows that the rise coincides instead with two dramatic events reshaping economic circumstances of large voter groups. The first event is tied to a Center-Right coalition, which won power in 2006 and stayed in power until 2014 on a radical agenda that included dramatic tax and spending cuts to âmake work pay.â These reforms substantially raised the income gap between people with stable and unstable employment. Employed insiders saw their incomes rise from a series of Earned Income Tax Credits, but outsiders without stable employment, dependent on sickness benefits, unemployment support or social-assistance programs, saw their incomes stagnate as a consequence of social-insurance austerity. The second economic event is the 2008 financial crisis, which raised insecurity among insiders vulnerable to automation, relative to insiders with more secure stable employment. Seen in this light, the growth of the radical-right was not caused by the Swedish state being too inclusive toward immigrants, but by becoming less inclusive toward the econo mically unfortunate. We use administrative register data to show how the two economic events affected income inequality and job insecurity over time. The left graph in Figure 1 shows how, during the two periods of Center-Right rule, the gap in average disposable income between the aforementioned labor-market insiders and outsiders grew by 20 percent. For outsidersâ"who account for more than 35 percent of the adult population throughout the periodâ"average disposable income flattened in 2006. The right graph in Figure 1 shows that the Great Financial Crisis in 2008 did little to the job insecurity of insiders with safe jobs, labeled secure insiders. But the risk of job loss went up considerably in occupations at higher risk of replacement though automation, which we refer to as vulnerable insiders. Figure 1: Economic inequality and job insecurit y on the Swedish labor market. Sweden Democrat politicians are substantially more likely to belong to the groups of (relative) economic losersâ"that is, the outsiders and vulnerable Insidersâ"than the politicians in other parties. Using data for all elected local politicians between 2002 and 2014, Figure 2 shows the shares of the labor market groups for the Swedish adult population, radical-right politicians, and other-party politicians. The Sweden Democrats are distinct in that their politicians predominately come from the groups whose economic standing was negatively affected by the two economic events. Outsiders and vulnerable insiders comprise about half of the population, but more than 60 percent of the SD politicians. In contrast, outsiders and vulnerable Insiders account for only 30 percent of the other-party politicians, who instead dramatically over-represent secure insider s. This is alsoâ"and especiallyâ"the case for the left-leaning Social Democrats and the Left Party. Figure 2: Labor market composition of the Swedish population compared to politicians from the Sweden Democrats and other parties, 2002â"2012. We also show that the Sweden Democratâs over-representation of labor-market outsiders is greater in municipalities with larger shares of such outsiders, and the over-representation of vulnerable insiders is greater in places where insiders are more likely to be vulnerable than safe. In addition, the connection between the economic background of Sweden Democrat politicians and the âmake-work-payâ reforms is even more pronounced if we sub-divide the outsiders into smaller categories. In general, we see that greater income losses of a group compared to the labor-market insiders since 2006, is associated with greater ov er-representation among Sweden-Democrat politicians. Compared to other parties, six times more Sweden-democrat politicians are on disability insurance, and nearly five times more are long-term unemployed or economically inactive. We study electoral outcomes with the same categorization of labor market groups. As ballots are secrete, we can only do this at the municipality level, orâ"within municipalitiesâ"at the electoral-district level. Figure 3 shows municipal-level correlations between the Sweden-Democrat rise and the growth in economic anxiety. It plots the growth of the partyâs vote share between 2002 and 2014 against the increase in insider-outsider inequality between 2002 and 2014, and against the vulnerable-insider share in 2006. Evidently, the Sweden Democrats grew substantially more in municipalities with more people who were economic losers in the same period. This is true for municipalities with a lar ger income gap between insiders and outsiders, and for municipalities with more vulnerable insiders among those with stable employment. These correlations are robust to a battery of modifications, from measurement via changing the aggregation level to including a number of important controls. For example, redoing the analysis for (within-municipality) electoral districts confirms the connection between economic misfortune and Sweden Democrat growth and shows that this connection gets stronger over time. In addition, correlations are highly robust to flexibly holding constant the education and industrial composition of the population, as well as various measures of immigration. The inflow or levels of non-European immig ration, either to the municipality, neighboring municipalities, wider labor-market regions, or to the occupations that account for a greater share of the local labor market, do not affect our conclusions on the role of economic inequality and job insecurity. Of course, the lack of a direct relation between local immigration and Sweden-Democrat growth does not rule out an important role for general anti-immigration rhetoric in the partyâs message. For example, economic losers may identify more strongly with their own group, and thus become more receptive to the message of a party that puts the blame for their predicaments on out-groups such as immigrants (and the establishment). Many have attributed the success of the Sweden Democrats to Swedenâs open immigration policy. Instead, our research shows that income inequality and labor-market conditions are important to understand the rise of the radical right in Sweden. Sweden Democrat politicians a nd voters both come from groups whose relative economic status have declined by the unemployment risk caused by the financial crisis and as a consequence of the make-work-pay reforms. In short, the fuel for the radical right in Sweden may not have been too much inclusion but too little. Dal BÃ³, E., F. Finan, O.Folke, T. Persson, and J. Rickne (2018). Economic losers and political winners: Evidence from Swedenâs radical right. Mimeo, UC Berkeley and Stockholm U.
Rydgren, J. (2007). The sociology of the radical right. Annual Review of Sociology 33 (1), 241â"262. Rydgren, J. (2018). The Oxford Handbook of the Radical Right. Oxford Handbooks. Oxford University Press. Disclaimer: The ProMarket blog is dedicated to discussing how competi tion tends to be subverted by special interests. The posts represent the opinions of their writers, not necessarily those of the University of Chicago, the Booth School of Business, or its faculty. For more information, please visit ProMarket Blog Policy.